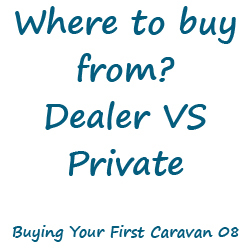 It’s time for post number 8 in the “Buying Your First Caravan” series. I am excited because I have written over 6,500 words so far! 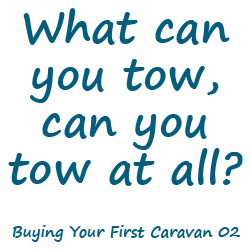 Who would have thought that there is that much to say about buying your first caravan? Well there is at least 3,000 more to go so I’d like to thank you for sticking with me and I really hope you are enjoying and getting some value from it. So we are getting near the purchase stage and we need to start thinking about where we are going to buy from, and that is what today’s post is all about. Who to buy from – What are your options? This is by no means a complete list and I am sure people will have many of their own to add (let me know in the comments section below and if they’re good I’ll add them to the list) but these points are often overlooked by caravan buyers. I am not going to tell you whether you should buy from a dealer or from a private individual, but take these points into account when deciding who to buy from. Where to find caravans for sale? 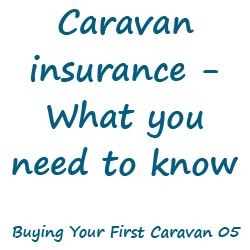 There is just one more thing I wanted to add to this post as I feel it is important that you should be aware of it when buying your first caravan. There are a lot of nasty people out there who are just waiting to take advantage of honest people. I have seen some ridiculously good deals advertised in various places (mostly online) that look too good to be true and they often are. Please just be cautious when you are looking around and be sure to ask lots of questions. I will be a lot more about scams in a post in the very near future. In summary we have talked about the advantages and disadvantages of buying a caravan from both caravan dealers and private sellers, where to find caravans for sale and a final word of warning to bear in mind during your search. Thank you for reading and I hope this post has answered some questions for you. I’d love to know your thoughts or anything you have to add on this subject, lets converse in the comments section below. 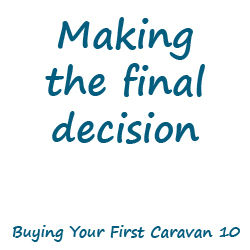 Tomorrow’s post, part 9 in the “Buying Your First Caravan” series is a very important one as we will finding out more about what to look out for when you go and view a caravan you are considering purchasing along with some questions you should be asking the seller.